(NEW YORK) — We’ve all heard of, and probably tried, various home remedies for cough and cold, from eating chicken soup to lathering on Vick’s VapoRub and wearing socks to sleep. But while most cough and colds are from viruses that might come and go without many complications, others, can be a little scarier. Croup, a cold-like infection that’s common in kids, is one of those. Jim Harbaugh, head football coach at the University of Michigan, recently spoke about croup on his podcast, “Attack Each Day.” On it, he talked about taking his two young children to the doctor for respiratory problems that turned out to be croup. His father had recommended a family remedy called mustard plaster — a paste made of dry mustard, flour and warm water — to help with cough and congestion. The doctor had never heard of this treatment, Harbaugh said. Treating croup can be a minefield of trial-and-error for people seeking real help. So here are some tips for treating croup. But first, what is croup? Croup is a viral illness, most often brought on by the parainfluenza virus. It causes swelling and narrowing of the vocal box (larynx) and windpipe (trachea), resulting in cough, noisy breathing and congestion. Children with croup often have a loud, low-pitched barking cough, and make noise when they inhale (called stridor). These symptoms normally last only a few days but a lingering cough can remain for up to three weeks. 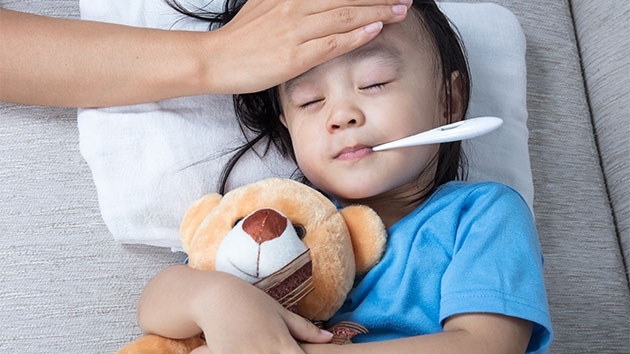 In many kids, it also tends to cause a low fever. Croup is most common in children ages 3 months to 5 years. In children over 8 years old and adults, however, the airways are large enough where the virus doesn’t cause as much swelling, and croup acts more like the common cold. Croup is contagious, especially during the first three days of the illness — or until the fever is gone. Kids can generally go back to school once they feel better and the fever is gone. One tip: Remind your children to cover their mouths with the inside of their elbows when they cough, and to wash their hands regularly. Most children with croup can be cared for at home, but if it’s severe, they may have difficulty breathing and should see a doctor. How do you treat croup? 1. Run the shower to steam up the bathroom. Allowing them to breathe in the warm, moist air will help relax the vocal cords and reduce the cough symptoms. 2. Breathe in cold air to relieve stridor. Take your child outside (if it’s cold out) or open the fridge or use a cool mist humidifier, and let them breathe in the soothing, cool air for a few minutes. 3. Use acetaminophen (Tylenol) or Ibuprofen (Motrin) to treat fever. If their fever is over 100.4 degrees Fahrenheit, these over-the-counter drugs are your best bet. Use as needed, according to the directions. 4. Use a saline wash to reduce stuffiness. If your child has a stuffy nose, you can try using a bulb syringe to get some of the mucus out. A few drops of nasal saline wash (a half-teaspoon of salt with 8 ounces of water) can be used to help loosen up the mucus, after which you can suction it out. 5. Use honey to soothe the sore throat and cough. A teaspoon of honey can help soothe an irritated throat, thin out mucus and loosen the cough. Important note: Only do this if your child is over a year old. 6. Drink fluids. As with all cold-like illnesses, make sure your child is staying hydrated and drinking enough liquids, such as water or Pedialyte. If they can’t drink or keep anything down due to the coughing or difficulty breathing, they should see a doctor as soon as possible. 7. Stay calm and wait it out. The more anxious or upset your child is, the worse the narrowing of the windpipe can get and the harder it can be for them to breathe. If you’ve tried all of this and your child continues to breathe noisily or have difficulty breathing, take them to the closest emergency room. Thy may need a dose of an oral steroid or a nebulizer breathing treatment to help bring down swelling. Some children may even need to be admitted to the hospital for closer observation, to make sure the swelling doesn’t come back or get worse. 1. Cold medicines. OTC medicines like DayQuil or Sudafed are not recommended for children under the age of 6 because they can actually be harmful. These medicines often contain a mixture of different medications that can cause excessive sleepiness or even suppress breathing. 2. Vitamin C. These supplements have not been shown to reduce symptoms or the length of time of the cough. 3. Zinc. These supplements also have not been shown to help with croup. So what about Harbaugh’s mustard plaster? There’s no available research to support the effectiveness of mustard plaster on treating cough or cold associated with croup. That said, it’s still a widely used home remedy with lots of anecdotal evidence to back it up. Before you go playing doctor at home, though, it’s always recommended you check in with your child’s pediatrician first.